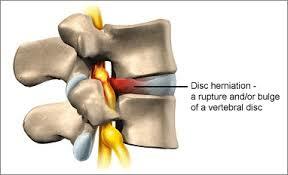 Arm pain from a cervical herniated disc is one of the more common cervical spine conditions. It usually develops in the 30-50 year old age group. Although a cervical herniated disc may originate from some sort of trauma or injury to the cervical spine, the symptoms commonly start spontaneously. The two most common levels in the cervical spine to herniate are the C5 – C6 level (cervical 5 and cervical 6) and the C6 -C7 level. The next most common is the C4 – C5 level, and rarely the C7 – T1 level may herniate. C6 – C7 (C7 nerve root) – Can cause weakness in the triceps (muscles in the back of the upper arm and extending to the forearm) and the finger extensor muscles. Numbness and tingling along with pain can radiate down the triceps and into the middle finger. This is also one of the most common levels for a cervical disc herniation .